Pantheon: temple for the worship of the gods. Emperor Hadrian built it in early second century in Rome. Romans adopted the Greek gods. In 609, Pope Boniface IV converted the Pantheon to a church. Courtesy: Wikipedia. The Greeks invented their gods in the universe and the universe in their gods. The two are inseparable. Herakleitos, 540-480 BCE, said that all things are in a state of flux, and the heart of the universe is pure fire. He was a philosopher from Ephesos, a Greek polis in the west coast of Asia Minor. He is right when he says that the “gods become men and men gods, the one living the death of the other, the other dying the life of the one” (Fragment 66). 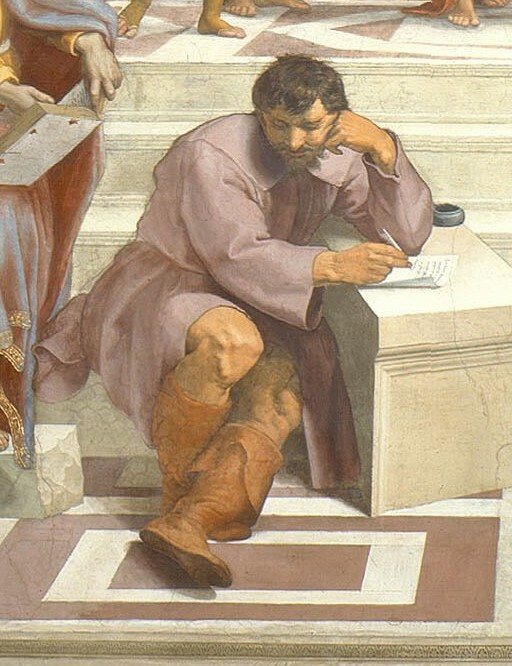 Herakleitos by Raphael Santi in "The School of Athens," 1510. Courtesy: Wikipedia. This is particularly true for the early Greeks and their gods. Most of the Argonauts were sons of gods. 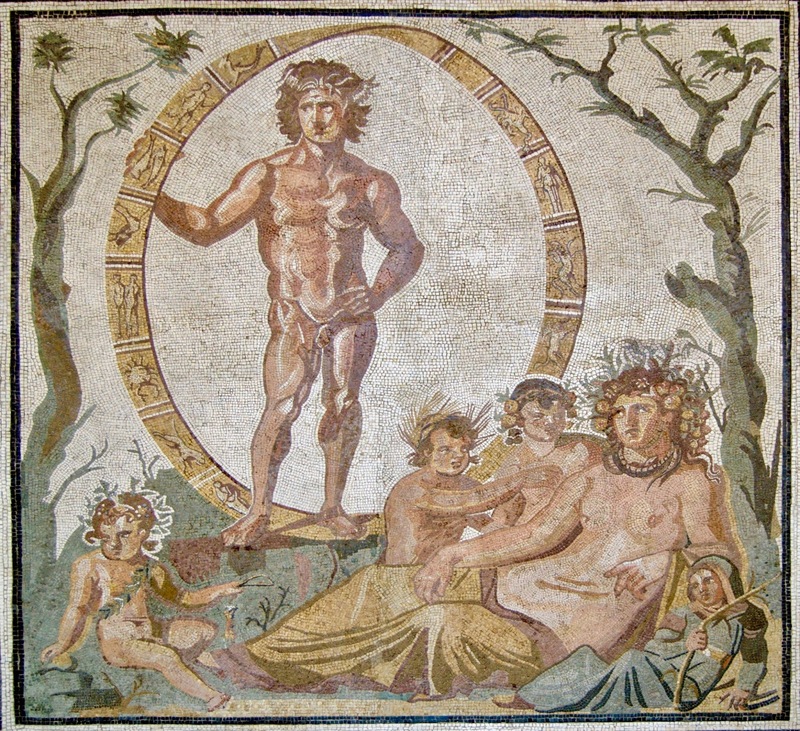 And even Kirke, her brother Aietes, children of the god Sun (Helios Hyperionides, son of Hyperion) and Medeia, daughter of Aietes, have a place in the Greeks’ cosmos and their gods. Raphael Santi (1483-1520), "The Council of the Gods." Courtesy: Wikipedia. One of those gods, Themis (daughter of Gaia –Earth – mother of the Seasons and Fates, wife of Zeus, mirror of Justice) also showed the Greeks to worship the gods. She convinced them that the oracle at Delphi was the prophet of the gods. She taught god Phoibos (the bright) Apollo the art of law giving (Orphic Hymn to Themis 79). Herodotos, the great historian of Hellas’ golden age, puts Delphi at the very heart of Greek piety, politics, and culture. Delphi was so well known all over the Mediterranean that non-Greeks also sought policy advice from Pythia, the priestess of Apollo at Delphi. The Lydian kings Gyges, c.680-645, and Croesus, 560-546 BCE, had enormous respect for the integrity and truthfulness of the Greek oracles and gods. They brought so much gold and other precious gifts to god Apollo at Delphi that the polis of Delphi gave citizenship to any Lydian who requested it. No Greek polis would start a colony outside of mainland Greece or undertake anything significant like war without consulting Pythia. "Priestess of Delphi" by John Collier, 1891. Art Gallery of South Australia. Courtesy: Wikipedia. In fact, even when Greek armies were facing their enemy, which could be other Greeks or barbarians, they first asked their diviners to look at the entrails of the sacrificial animal for good omens from the gods before they went into battle. Herodotus is certain that Apollo defended Delphi against the invading Persians just before the battle of Salamis in 490 BCE. He also says Demeter doomed the massive Persian fleet at Salamis. Herodotos has no doubt that the oracles of the gods are true, particularly the Boiotian oracle of Bakis that foresaw the Greek victory at Salamis. The gods, Herodotos says, sided with the Greeks during the massive Persian invasion of Greece so that they would restore a balance in what was a hugely unequal struggle. Herodotos had no doubt the gods played an important part in human affairs, and Greek affairs in particular (The Histories 1.13-14, 46-55, 91-92; 7.8; 8.13; 9.100-101). In addition, laws and reason govern the Greek gods and the cosmos. 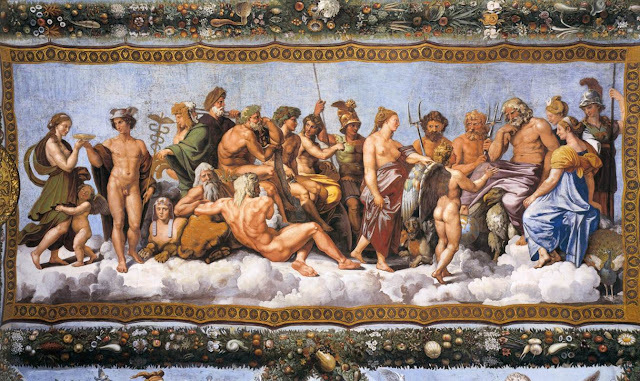 The English classical scholar Hugh Lloyd-Jones says that the Greeks set “the foundations of most of the chief arts of civilization” primarily because of their gods who gave them “the notion of a cosmos, an universe regulated by causal laws (The Justice of Zeus, 1983, p. 179). The American writer Henry Miller also sees the gods right in the Greeks’ vision. “The gods,” he says, quite perceptively, “humanized the Greeks (The Colossus of Maroussi, 1941, p. 236). The Greeks’ cosmos is open to investigation. That is why the Greeks began asking questions, explaining natural phenomena with data and reasonable theories they formulated from their careful observation of the workings of the natural world. That was the beginning of science. Ptolemaic celestial spheres in Cosmographia by Peter Apian, Antwerp 1539. Ptolemaios (Ptolemy) was a great Greek astronomer who flourished in the second century in Alexandria, Egypt. Courtesy: Wikipedia. Pindaros, 518-after 446 BCE, the great poet of Thebes known for his exquisite Epinician (victory) Odes in praise of the victors in the Panhellenic athletic and religious games, wrote that men and gods had the same mother, though they were vastly different in power. Nevertheless, Pindaros was certain, that men, in some way or another, resembled the immortals “in greatness of mind or nature” (Nemean 6.1-7). Some seven centuries later, Galen, Greek scholar, philosopher, and great physician of the second century, said that mortals have something in common with the gods – and that is reason (An Exhortation to Study the Arts 21). (1) The god of southern wind, Notos, was the father of rain, Zeus having given him the prerogative of sending rain-giving clouds from the sky to earth (Orphic Hymn to Notos 82). (2) Hephaistos, son of Hera, is fire – the all-devouring, all-taming, and all-haunting part of the universe. Hephaistos – the god whose craftsmanship sparked metallurgy in the Aegean island of Lemnos and Caucasus -- is the eternal artisan who brings light to mortals who see the ether, the Sun, the stars, the moon and pure light through him. Hephaistos in fact lives in mortals and, because of that, nature itself burns in their bodies. In other words, Hephaistos, the god of fire, is reason in the cosmos and in the world of men (Orphic Hymn to Hephaistos 66). Hephaistos hands Thetis the shied he crafted for Achilles. 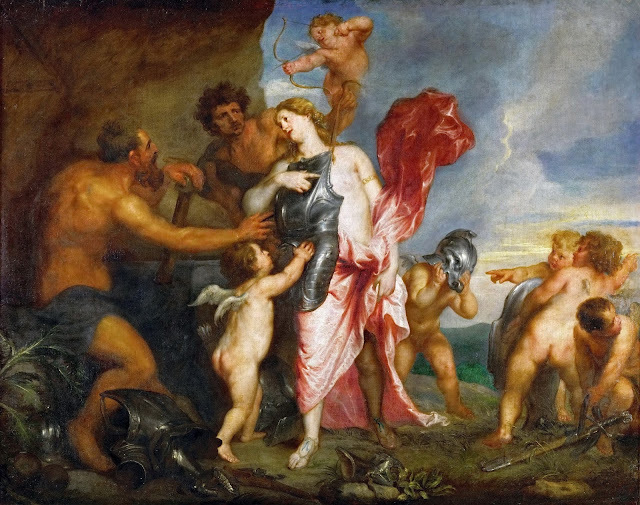 Paintin by Antony van Dyck, 1630-1632. Courtesy: Wikipedia. (4) Okeanos, the mighty river around the Earth, was where all life, including the gods, came from. He was also the father of all seas, rivers, and streams of the Earth from his marriage to his sister Tethys. Aristotle confirms that the ancient Greeks considered Okeanos and Tethys the parents of creation. The gods themselves took their oath by the water of the Styx (Metaphysics 983b29-33), a river in northeastern Arkadia. Hesiodos says that the gods would pay a terrible price if they swore a false oath by the primeval and immortal water of Styx (Theogony 793-806). Water was at the heart of the Greeks’ cosmos. It became the key with which Thales opened the origins of the cosmos. Thales was a sixth century BCE Greek cosmologist from Miletos, a flourishing Ionian polis on the coast of Asia Minor near the mouth of the river Maiander. Herodotos says Miletos was the pride of Ionia (The Histories 5.28). Aristotle considered Thales the founder of natural philosophy (Metaphysics 983b20). Thales made water the foundation of the universe. He said the Earth rests on water (Aristotle, Metaphysics 983b21). Thales also believed that “all things are full of gods” (Aristotle, On the Soul 411a7-8). Aristotle, too, believed the Greeks’ forefathers thought that the first substances or principles governing the cosmos were gods. It was like the divine enclosed the whole of nature. And reason was also present throughout nature and the universe. In fact for Aristotle reason was the explanation for the world and for that world’s order (Metaphysics 984b15-20; 1074b1-14). In addition, Aristotle considered the gods the greatest benefactors of humankind. Just like children are drawn to their parents with affection and love, Aristotle said, so men and women have an affection and love for the gods who are responsible for their existence, nourishment, and education (Nicomachean Ethics 8.12.1162a4-7). Thus the gods and reason – both essential for the origins, order and very being of the universe – were complementary. That explains why the Greeks did so much with science, which they invented. Their gods were the beginning of their cosmology. They were always curious and eager to understand the cause and effect relationships in nature without the aid of superstition. They were perpetually perplexed and delighted by the beauty, reason, and order of the natural world and the cosmos. Their gods had to be reason, and they were. Archilochos, a seven-century BCE poet second only to Homer in greatness, put the Greeks’ attitude towards their gods this way. “Attribute,” he says, “all to the gods” (Fragment 23). Some 3,000 years after the Greeks thought out carefully their rational and beautiful picture of the cosmos, the cosmology of the Western people is a black hole for gods and, to some degree, science as well. By science I mean theory and applied reason, an intelligent way of making sense of the massive and exquisitely beautiful cosmos. I am not making fun of the technical achievements of Western scientists. Their satellites and telescopes are expanding our knowledge of the universe. I am simply suggesting that, when it comes to a theory of cosmology explaining the origins and creation of the universe, the Western view is, most probably, that of science fiction. Western astronomers and physicists on the dawn of the twenty-first century speak of the “inflation” theory of how the universe came into being. They say they believe the “universe began in an extraordinary explosion known as the Big Bang” (National Research Council, Nuclear Physics, 1999, p. 112). In addition, they say that the universe arose from a very small matter during the violent burst and a moment after it. Brian Greene, a physicist making a career out of the Big Bang theory, is quite certain that at the moment of the huge blast “the whole of the universe erupted from a microscopic nugget whose size makes a grain of sand look colossal” (The Elegant Universe, 2000, p. 4). Greene is a proponent of what he calls a “superstring” or “string” theory, according to which, the particles of nature behave not like point-particles but rather like loops of vibrating string. These vibrating-string particles of nature, the electrons and quarks making up the atoms, for instance, eliminate the incompatibility between quantum mechanics (of the microscopic world) and general relativity (of the universe). No wonder Greene is optimistic that this string idea could, one day, put everything in the universe under the marching orders of a single grand principle, a master equation. The string theory could become a theory of everything. But that’s highly unlikely. So much power in the hands of even a god would be dangerous. The Greeks knew that so they made their gods and cosmogony, and cosmology democratic. Western scientists, however, believe in a neat separation between their science and society. 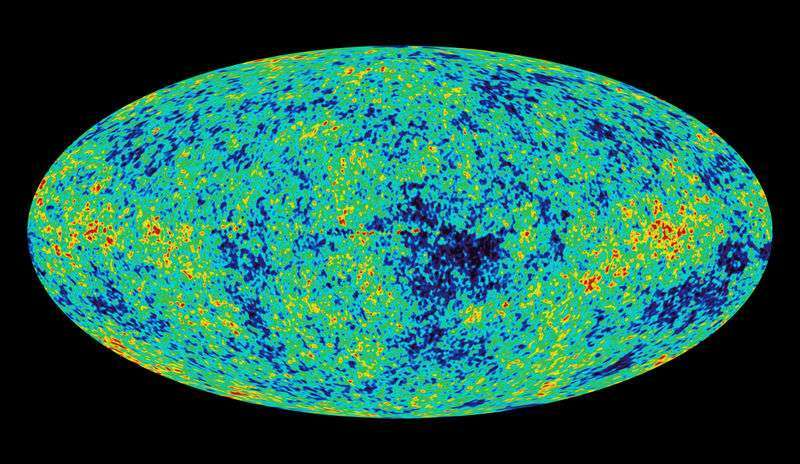 They claim the universe is flat because of the afterglow of the Big Bang. They dub the afterglow cosmic microwave background radiation. NASA's vision of the afterglow of the cosmic microwave background radiation. They sent a balloon-telescope 5,000 miles above the earth. The telescope took pictures of background radiation and, from that analysis of light, they say they captured photons (particles of light) dating from the very moment of the Big Bang explosion, some 10 to15 billion years ago. This claim boggles the mind in its overwhelming demand for perfection and faith in perfect super-telescopes, satellites, and high-tech science. We know, of course, that scientists and humans in general are by no means perfect beings. To think that the truly gigantic cosmos sprang from an atom, and was brought into existence by no less than an explosion, is blind faith in miracles. In addition, something like 95 percent of the universe is invisible to astronomers since it is dark matter or high-energy radiation. Yet Big Bang cosmologists insist they are right from the questionable measurements they took of the so-called cosmic microwave background radiation. The Big Bang explanation of the birth of the universe is a child of Christian thinking dressed, first of all, in the impressive Opticks and Principia works of Isaac Newton, the eighteenth century British natural philosopher who believed in an infinite universe made by the god of the Christians. Newton’s universe lasted 200 years until the Jewish physicist Albert Einstein in early twentieth century argued the universe was of uniform density, curved space, and finite nature. Alexander Friedman, a Russian mathematician writing in the 1920s when Einstein was proposing his theories, said that the density of matter making up the universe was related to time, suggesting that perhaps the universe was expanding. Friedman’s hunch was made slightly more plausible by the British astronomer Edwin Hubble who discovered that nebulae or distant galaxies could possibly be moving away at great speeds – at least that is what astronomers said about his measurements of the possible fast movement of those extragalactic stellar systems. Hubble, however, saw no relation between his observations of far away galaxies and the origins of the universe. He was also doubtful the universe was expanding. From these tenuous hints of Friedman and Hubble – that the universe could, in theory, be expanding – the Big Bang scientists constructed their preposterous claim that the cosmos came into being 15 billion years ago with the shuttering explosion of an infinitely small grain of matter. How convenient that these experts, whose hubris has even dubbed their untenable speculation “the standard cosmological model,” turned science upside down by reaching the same conclusion as the Biblical legend of creation – that the Judeo-Christian god built the cosmos from nothing. This is a disturbing proposition that leaves some scientists concerned about the nature of their enterprise. In 2015, some physicists rejected the big Bang theory, arguing that the cosmos may have existed forever. The Big Bang theory brings into conflict fundamental ideas in science. Gravitation, explaining huge forces of the universe, and the quantum, making sense of the microscopic world, become opposite to each other. Saying that the universe came out of a huge explosion fails to explain the start of the cosmos, and, just as fundamentally, what about before the Big Bang? “Nothing” is not legitimate for an answer. Bernard Lovell, a British professor of radio astronomy, asks the “ultimate” question. “If the universe evolved from the big bang,” he says, “what existed in the beginning? To argue that the universe came from nothing, as … contemporary theoretical cosmologists maintain, is a brilliant mathematical evasion of a problem that may lie beyond human understanding” (“Out of the Quagmire,” The Times Literary Supplement, July 13, 2001, p. 4). The Greeks did not argue the universe came out of nothing. Their commitment to philosophy and reason would not tolerate such an absurdity. Greek cosmology assumes no one created the universe. Aristotle said the universe is eternal (On the Heavens 277b28-29). The cosmos is forever. It has no beginning or end. 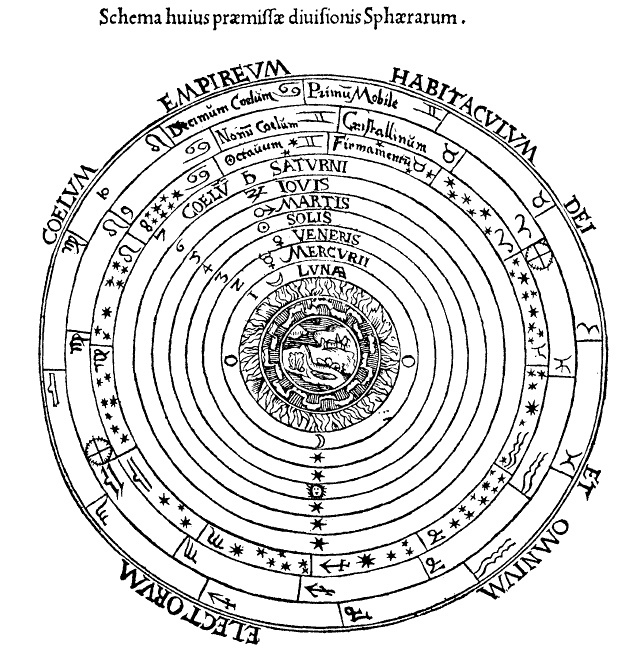 Furthermore, Greek cosmology includes no mathematical or other kind of evasion. Aion (Αιων) or immortality represented by the young man surrounded by the imaginary circle of the zodiac, thought to be the path of the Sun in the constellations. The sitting woman is the Earth and the children represent the seasons. Mosaic, Roman Villa, Sentinium, 1st half of the 3rd century BCE. Munich Glyptothek. Courtesy: Wikipedia. Greek cosmologists included Eros in their vision of the cosmos. Eros was the cosmos. Eros was the Earth and the gods. There had to be intense love for all the magnificence of the universe. And the Greeks tied everything with water without which no life is possible. But what is attractive or philosophical about an explosion? Nothing. The Big Bang mirrors more than Christian creation myths. It is even a stronger mirror of the Western scientists’ immersion in nuclear bombs. Now that “physicists” live with their nuclear bomb creation, a monstrosity infinitely worse than the Greek monster Typhoios or Typhon, they cook up the birth of the universe out of the only thing they know and trust – atomic weapons. These terrestrial big-bang bombs blast any efforts at a rational cosmology, which can make sense of all the data scientists have about the universe. They are also pure evil. Says Tyler Stevenson, a specialist in nuclear disarmament: “We the people continue our mute permission of nuclear weapons, death camps in our own backyards, with thousands of hydrogen furnaces at the ready” (“The Moral Flaws in Our Peace,” Christian Science Monitor, July 26, 2000). With such political and cultural and scientific reality molding the minds of scientists, how is it possible to think of the beautiful cosmos as anything but the product of a massive nuclear explosion, the Big Bang? This is another way of saying that we need the Greeks desperately now more than ever. Their cosmos may still inspire clear thinking about the purposes of human life, terrestrial life, and the life of the universe. Western industrial societies are monotheistic. Their economic models of extracting “resources” from the Earth have been threatening civilization. They heat up the Earth and pollute the global environment. They give disease and death to people and wildlife. In addition, the vision of these industrialized societies includes nuclear bombs, perpetual wars, and development-like wars against the natural world. We must face this ominous situation with Hellenic courage. Master science and technologies, but pass them through the filters of Hellenic thought and ethics. If this knowledge is inimical to life, discard it. If it sponsors the hegemony of the oligarchs, resist it. Build a new world with the insights of Greek natural philosophers. Take it for granted, the natural world and the cosmos are divine. Love and study the natural world and the cosmos for knowledge, truth and wisdom. This means, no matter what we do, our environmental and social policies must reflect our love for nature. Other priorities for a sustainable, Hellenic-like society should include: Scaling down the sizes of farms so that a working family can do all the work. Grow a variety of food without the use of pesticides or genetic engineering of crops. Become self-reliant and involved in your community, town and country. Clean up pollution and ban toxic chemicals. Convince the politicians to work for environmental protection and the universal abolition of nuclear weapons. The Greeks in Greece must wake up from their slumber and fight for their freedom. Say enough with the insults and orders and borrowing money from the European Union. Elect patriots and get out of the European Union. Be self-reliant in food – and everything else. There’s no reason Greeks can’t build electric cars, solar panels or busses and railroads. There’s no reason Greeks need so much foreign influence. Revitalize the villages. Each village can add to the country’s prosperity and strength. Turn to the Sun for energy for the entire country. Finally, have a Renaissance of publishing and studying ancient Greek texts. Join that process of learning with the archaeological treasures of the country to also educate the millions of tourists visiting the country every year. Advance beyond the achievements of ancient Greeks.